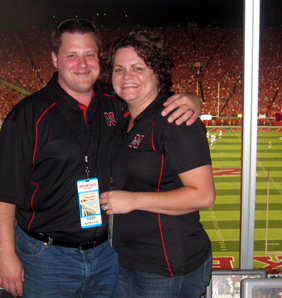 Kim and I had a great time cheering the Nebraska Cornhuskers to victory yesterday over the Florida Atlantic Owls. 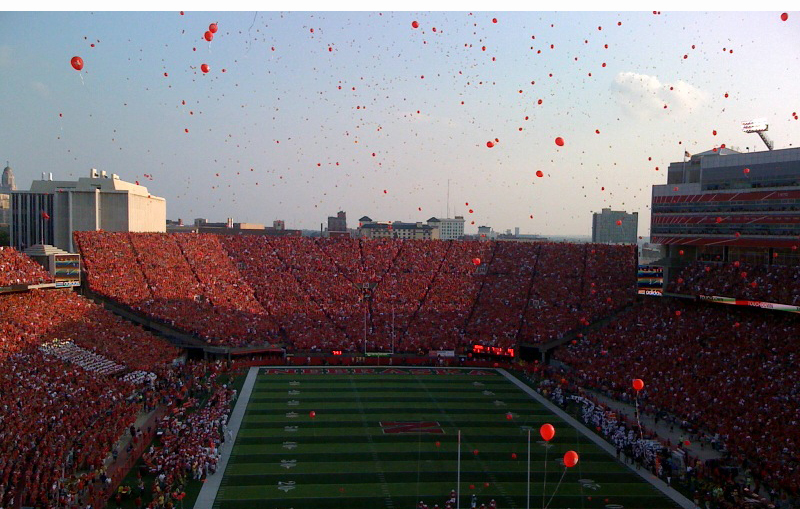 This was the Husker’s season opener and the first game that Kim and I have been able to enjoy from the skybox. It was a blowout game with Nebraska winning 49-3, although the Huskers are going to have to tighten some things up if they expect to do well in Big 12 Conference play. Our skybox used to belong to Larry the Cable Guy. Even though the bathroom is literally right outside the door of our skybox, every time Larry opened his door there was a throng of autograph-seeking fans waiting for him. Larry (Dan is his real name) has kids, and it made it tough to enjoy the game with his family at times. Larry moved on over to one of the new North Stadium skyboxes that has its own bathroom to resolve the situation. Aside from giving Larry a new kind of stadium seat, it gave us the opportunity to log a few games in his old skybox! The skybox was definitely nice (it had better be at an annual price tag of $85,000). We had a dedicated hostess who was there to make sure we had everything we needed. All of the typical stadium favorites were available (hot dogs, pizza, etc..) and they are even more irresistible when they are absolutely fresh from the oven. Nebraska Athletic Director Tom Osborne sat about 20 feet from us, and he was just as calm and reserved as he was when he was coaching the Huskers on the sideline. He mechanically ate one tortilla chip every 42.5 seconds, took notes after every play, and did not speak to anyone that I saw. Occasionally you would catching him nodding ever so slightly in approval. By the third quarter those tortilla chips started catching up with him. If you were quick you could see him dozing off a little once the Huskers had the third stringers in the game.